Trade with Warpless Trade OSB in Njord system, the closest and most efficient trade spot for selling to Ceres! Njord is gated to Menzel 3 to ensure efficent refilling of stocks with NPCs. Warpless Trade OSB have a big demand for supplies to insure the stocks are filled and available for those trading with Ceres. Remember that sell price at production location needs to be at least 1 credit lower for NPCs to work. Not high enough buy price? Please let me know what items you are interested in selling and maybe we can negotiate a price high enough to make it interesting for you. You can see how prices are calculated in the second post in this thread, and what consequence a change will have. Only included the most wanted items. Its already a lot for sale at cheap prices or you need to scroll to sell at Ceres for these items, making them less wanted than the items in the first list. We still want to buy them, but dont expect to be able to sell large amount over time or to negotiate better prices for them. Want to avoid the hassle of selling at LM? Sell it to Warpless Trade or at your own OSB (I will send my NPCs to bring it to Warpless Trade) and let someone else haul it to LM. No need for switching from your mining ship to a ship that can dock at i9 SS. That is the same as LM buys for at +20% for Uranium and +13% for magnesium. Hauling from Warpless Trade in Njord is the fastest and most profitable way of hauling to Ceres, by far! You dont need to warp at all! Warpless Trade is located at the hyper jump entry point of Njord, SM is available imidiatly as you enter Njord. Dont use version 1.5###, that will put you randomly in a different location when jumping to Njord, forcing you to warp before you can open SM at Warpless Trade. 218k cargo space with a Lev! No warping means you only need class 1 reactor and capacitor, giving a Lev with HD an amazing 218k cargo space, earning more each time you sell at Ceres, having to jump back and forth less times to earn the same amount of credits. Closest system to Ceres! There is no closer system to Ceres than Njord, only need 104 hydrogen to jump from Ceres to Njord with a Lev, and 0 for e-jump back. Quickest trading with Ceres in the whole galaxy! Its possible to hyper jump to Njord, buy at Warpless Trade, e-jump and sell at Ceres all within 30 sekunds. Thats almost 2 billion profit in 5 minutes for selling carbon at 40% margin! Same profit for several items! 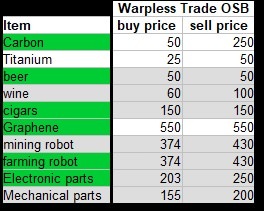 Prices are set so minimum profit will be the same for all items sold at Warpless Trade, which means when hauling you can choose the item that currently has the highest margin at Ceres LM, insuring you always get a good deal. Is carbon price at LM only +5%? Haul something else that is closer to +40% margin. No more waiting for carbon price to be high! Its also more fun than only hauling carbon. Less time spent hauling to Ceres = more time for fun stuff! Items in green does not need scrolling at Ceres LM. Look for SMs that are selling any of the items Warpless Trade is buying, and help fill up the stocks. The sell price must be lower than the buy price at Warpless Trade. The price difference will be your profit. Anyone with opinions or suggestions about prices please share in this thread or let me know by PM. Feel free to use numbers from here in discussions about LM prices, but please take the discussions about the LM prices in other threads (we already have several of them), and lets keep this thread for discussing buy and sell prices at Warpless Trade. -This post was completely remade 12th august 2018, some posts in this thread was a reply to the old post before this time. Last edited by Loke on Sun Dec 30, 2018 5:41 pm, edited 13 times in total. Haulers profit when selling at LM at price +20%. Currently set to 700. This sets the sell price at Warpless Trade OSB: "LM base +20%" - 700 = sell price at Warpless trade. Lowering it will make sell price at Warpless Trade higher, making it harder to compete with other OSBs selling the same items cheaper. Increasing it will make haulers profit increase and decrease buy prices at Warpless Trade, could also remove items from Warpless trade do to pushing buy price below 0. OSB profit: Difference between buy and sell price at Warpless Trade. All items have a default difference of 35 + 5% of sell price to make Warpless Trade profitable. The difference can be lowered for one item and then equally increased for another, which allows higher buy price for items with low supply, when items with high supply gets a lower buy price. This is what is easiest to change and is what suppliers should try and negotiate a good price for the item they are producing. Only limitation for moving OSB profit from one item to another is that buy price cannot be > sell price, and buy price needs to be > 0. Last edited by Loke on Wed Aug 29, 2018 4:29 pm, edited 3 times in total. Certainly gives us some stats to work on. One slight correction: the supply of carbon does not exceed demand, since demand for any product on the LM is infinite. However, the production of carbon does exceed that capacity to move it from the outer colonies to the LM or, indeed, to any new gates where, together with iron, many millions of units are required. My view is that we need NPC pilots to work reliably and be able to transfer goods as well as trade goods. This will mean that colony owners can have their goods moved from the colony to the linked OSB automatically and not have to do it themselves. This would, also, aid in resupplying colonies and OSBs with food, luxuries and medical supplies. Trading, as an occupation, is not really viable at the present time. The software developed for searching the OSB/Colony Stock Markets does not give sufficiently viable results to allow pilots to make good decisions on what and with whom to trade. It is all very well buying at pilot controlled SMs and selling at the Local Market, but this just floods the pilot economy with cash. I think we need to think of a way to increase usage of materials by pilots of long standing who can then replenish their stocks by using other pilots to bring them goods. This is going to be very difficult since the UNCA allowed pilots to purchase unlimited amounts of Stellar Credits; which has given pilots the ability to construct an unlimited number of colonies and OSBs. This means that most long-serving pilots are, or can be, self-sufficient. thus reducing, or negating, their dependence on other pilots. However, it has promoted the exploration of the Galaxy. Perhaps we should also be looking at ways we can become less dependant upon the Inner Systems, the Local Market and the Galactic Market. Would it be a good idea to be able to sell ships and ship modules from OSBs as well as from the Inner System Star Stations and your ISB? Mooncrest wrote: Interesting numbers here, Loke. I meant demand at the OSB I plan to setup. An item is in high demand if we haul more to LM than is being supplied to the OSB. To be able to choose what I want to haul to LM, there needs to be enough in stock at OSB of all items. Carbon is easy to fill stocks at OSB, so its in low demand and OSB buy price should be lower because of that. Most of the other items have small amounts for sale at low enough prices, thats why I say it is a demand. How to fill it? Trading, as an occupation, is not really viable at the present time. Trading in this context is me (or anyone else) that hauls from OSB to LM. And the purpose of bringing it up here is to make other items as profitable to haul to LM as carbon, and what we can do to achieve that. AS an alternative to forever waiting on improvements made by UNCA. Edit: There will also be increased trading with colonies and OSBs that produce the items listed, as I am not able to supply enough of that myself. The software developed for searching the OSB/Colony Stock Markets does not give sufficiently viable results to allow pilots to make good decisions on what and with whom to trade. The SM search is unfortunately not good, I agree. Could discussing prices here and make some charts etc be a helpful workaround for now? I plan on doing that for this OSB, to make it easy to see what items needs more prodution and should be prioritised when new colonies are buildt. It is all very well buying at pilot controlled SMs and selling at the Local Market, but this just floods the pilot economy with cash.True, but it happens anyway, lets see if we can make it a bit more interesting and also give some profit to those who build production, especially production of items we do not make a lot of curently. Mooncrest wrote: I think we need to think of a way to increase usage of materials by pilots of long standing who can then replenish their stocks by using other pilots to bring them goods. Good suggestions Moon, you have my support. IN this thread though I will focus on what we can change,and that is what buy prices I should use at my future OSB for Titanium, beer, wine, cigars, graphene, robots, elec and mech parts. I really need input on what it takes to make it interesting for people to build production of those items. Last edited by Loke on Sun Jul 22, 2018 11:13 am, edited 1 time in total. Loke wrote: I want to haul different items from OSB to LM, not just carbon, with equal chance of the same profit, and only look at which LM price is currently at the highest margin (0-40%). I will make an OSB close to Ceres buying and selling as above. Therefor I need more sellers of all the items in the table above, except carbon, would you sell any of them at the suggested prices? If no, then at what price? Why don't we develop another hub to the Inner9 and gate it to Sol I. This means we haul anything except carbon since they do not buy it? I want as many items in stock at OSB as possible, to choose between for hauling to LM, so removing one (even carbon) isnt helping. Also I need carbon as an item I can decrease OSB buy price for, so that other items can get higher buy prices. I doubt I am able to buy much of the OSB T2 items, except some graphene maybe, do to how low OSB buy price have to be. I should be able to get titanium, hopefully cigars. But beer and wine migth be difficult. Im hoping to have like 5-6 items in stock at OSB, but that will take some time to build up production for I think. If we can keep improving as we go on price to increase interest (thats why I need input from others), there should be possible to get dicent supplies of more items in the future. A Sol I. connected hub wouldnt benefit from e-jump, making it less interesting. The system Njord (previous name Johneaux-52), the closest sytem to Ceres, is now set up for the quickest trading with Ceres possible. Gated to MZ3 for npcs to bring supplies. Most importantly I buildt an OSB, named Warpless Trade, at the location hyper jump takes you, so no need for warping, SM open imidiatly. It now only takes 30 sec to load up, ejump to Ceres, sell and jump back again, ready for next round. Also since no warping is needed, a cl 1 reactor and cap is enough, which gives the Lev 218k storage. If any of those are inteeresting, please send your NPCs to fill up stock at Warpless Trade. Also nice having more items to choose from when carbon is low price at LM. Only thing I didnt like is that the profit wasnt equal enough between different items when selling to LM. Basing it on equal profit at base still gives considerable difference at higher LM pirces. So now I have changed prices at Warpless Trade to give 700 profit for all items when LM price is +20%. Making hauling profit a lot more similar for different items. So basically now any item at LM price +20% or more is what you want to haul, below 20% is not a good deal. Also liked that OSB T2 buy prices increasd some due to this change. Prices for tritium, uranioum and magnesium increased to, really making it a decent option to spending time finding a high LM price. profit under LM is what hauler gets (LM price - OSB sell price). That is the same as LM buys for at +20% for Uranium and +13% for magnesium! Miners dont waste your precious time, sell quick and easy to Warpless Trade in Njord and load up on hyrdogen at the same time!